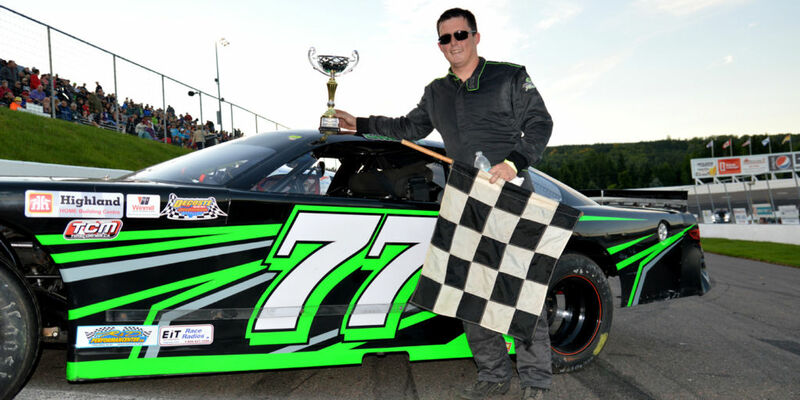 Donald Chisholm (Antigonish) captured his second win of the Parts for Trucks Pro Stock Tour season by winning the Lucas Oil 150 at Riverside International Speedway on Saturday. The defending Lucas Oil 150 winner and 2015 series champion battled for the lead late in the race with current point leader Cole Butcher (Porter’s Lake). Butcher finished second and was joined on the podium by Greg Proude (Springvale, PE), who finished third. Rollie MacDonald (Pictou), a Canadian and Maritime Motorsports Hall of Fame inductee and the series 2005 champion, rallied from being a lap down to finish fourth in his first race since 2012. Shawn Turple (Enfield), two-time series champion, finished fifth among the 20 teams that entered the race. Chisholm led 121 laps en route to the victory; he took the lead on lap 21 after starting third on the field. Buther started on the point but was quickly passed by Craig Slaunwhite (Terence Bay) who led until being overtaken by Chisholm. Atlantic Tiltload Qualifying heat race winners were Butcher, Slaunwhite, and Chisholm. Steve Ross (Waverley) finished ninth to take home the King Freight Future Winners Award while Harry Ross White (Noel Road) moved one step closer to the Exide Batteries Rookie of the Year Award by being the top freshman at the Lucas Oil 150 with a 10th-place run. Butcher will carry an almost insurmountable 51-point lead to the series season finale at Scotia Speedworld next Saturday. Slaunwhite fell from second to third overall after mechanical issues on lap 117 forced him to the pit, resulting in a 16th-place finish. Chisholm’s win moves him to second overall. Complete series point standings are here. Unofficially, even if Chisholm leads the most laps and Butcher leads no laps (both get bonus points), Butcher would only have to finish 21st or better next week to secure his first series title. The NAPA Sportsman Series kicked off the show with the Highland Home Building Center 75. Colby Smith (Cape Sable Island) was the winner with Shawn Waterfield (Sydney) and Waylon Farrell (Conception Bay South, NL) second and third, respectively. The Lucas Oil 150 closed the 2016 season at Riverside International Speedway. Fans can stay in touch with the facility news over the off-season by visiting this site, following them on Facebook or Twitter, or subscribing to the newsletter. 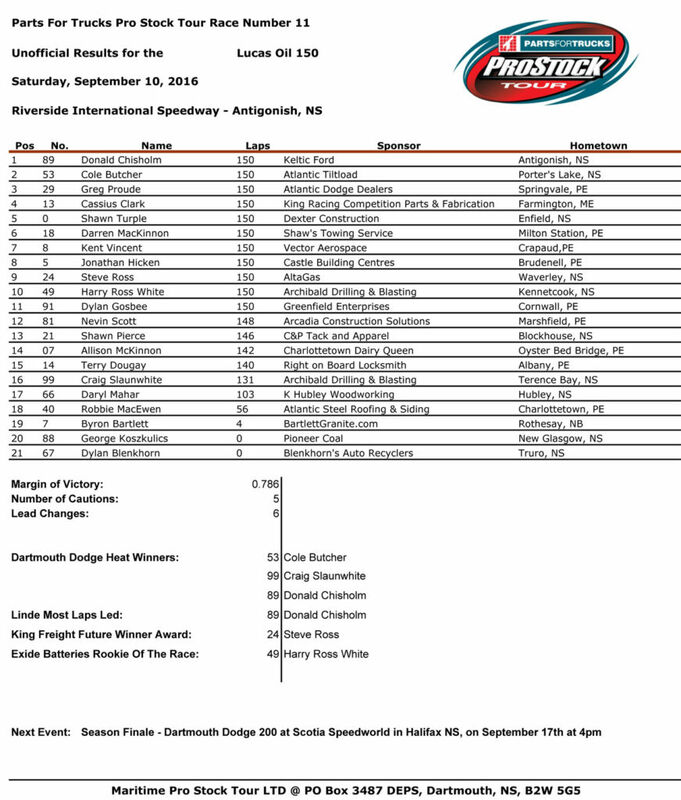 The Parts for Trucks Pro Stock Tour will finish the season next Saturday at Scotia Speedworld with the Dartmouth Dodge 200 set to crown the series 2016 champion. Racing starts at 4 p.m. Tickets will be available at the gate on race day (cash only). The Parts for Trucks Pro Stock Tour visits five tracks throughout the Maritimes during its May through September season. The Parts for Trucks Pro Stock Tour is owned and operated by Maritime Pro Stock Tour Limited. For more information, call the administration office at 902.481.2531 or visit www.maritimeprostocktour.com.